I’m not sure what I can say that can add to the loads of creativity of these finalists for Science and AAAS‘s (American Association for the Advancement of Science) 5th Dance Your Ph.D. contest. You can choose your favorite by visiting here and making your selection by October 15th. My hats off to all 36 entrants this year, you are truly inspiring and are the future of fantastic, fun and engaging science communication! 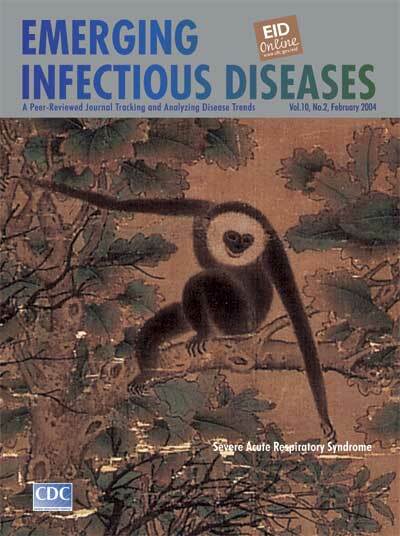 Thanks to a presentation yesterday at the Ecological Society of America meeting in Austin for alerting me to the art featured on the cover of the scientific journal Emerging Infectious Diseases. I was pleasantly surprised to find a gallery of cover art on the journals website. For each issue, there is a short article describing the relationship of the cover artwork to the research featured within. Most of these appear to be written by Polyxeni Potter of the CDC in Atlanta. I would love to know more about that job, writing art-cover-story pieces and how they relate to the science featured in each issue! Knowledge, a communal effort laboriously assembled piece by piece, relies on swift and purposeful give and take. Non-human primates more than once have held valuable clues to human puzzles, from AIDS to hepatitis. Sometimes the vehicle, but more often the oracle of zoonotic scourges, they have shared with us generously. In this the Chinese Year of the Monkey, the long arm of the gibbon may yet reach across the seas with seeds of knowledge for the global health community deciphering the puzzle of SARS. Images for the cover of Emerging Infectious Diseases are selected for artistic quality, technical reproducibility, stylistic continuity, communication effectiveness, and audience appeal. The images, which are published with permission of the artists or other copyright holders, are drawn from many periods (ancient to contemporary) and are used to “humanize” and enhance the scientific content by illustrating ideas, raising consciousness, revealing truth, stimulating the intellect, and firing the emotions. The cover story has evolved by popular demand, literally out of the journal readers’ wish to know the art and how it relates to them and to what they do. A sketch of the artist, period, and work, provides contextual knowledge, and a brief interpretation offers a link between the art and the human elements and goals of public health. The reader becomes familiar with the work, and in the end is surprised and, we hope, enlightened. You may also enjoy the cover of Volume 11 No. 4 on insect vectors of disease featuring the art of Albrecht Durer and Volume 10 No. 8 on avian vectors featuring the art of Emily Carr. Yet another elegant and creative way to help make the biological sciences more relevant via the arts, and vice-versa. Enjoy!